Get ready to sneak across the city of Dunwall and snack on canned whale meat once more, as Arkane studios is ready to unleash its new DLC for Dishonored. 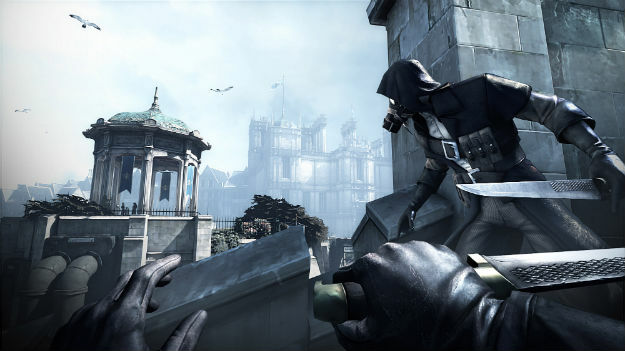 Dishonored: The Knife of Dunwall, due out in April, is a bit different than December’s Dishonored: Dunwall City Trials. Unlike those story-free downloadable challenges, The Knife of Dunwall returns to the story of Dishonored, but rather than taking up as the protagonist Corvo, you control his assassin nemesis Daud. The story runs parallel to Corvo’s in the main game and paints Daud not as a pure villain, but a character hoping to redeem himself after murdering the Empress and aiding in the military coup that changed the shape of the city. Like Corvo, Daud is gifted with powers by the Outsider, which Arkane says are different than in Dishonored. Some story details from Knife of Dunwall we already know from a leaked trophy list that hit the web in February. Daud is trying to track down a woman named Dillah Copperspoon and he has to infiltrate areas like aristocrat Thalia Timish’s estate and the Rothwild Slaughterhouse. That means that The Knife of Dunwall will give players their first full look at the city’s horrifying whaling trade. A note about the accuracy of previously leaked information on this round of Dishonored DLC. Industry leaks aren’t always trustworthy. It doesn’t matter how reliable a source may seem, sometimes they just plain aren’t right about something. Last May, for example, a so-called insider claimed that the Nintendo-owned Retro Studios was making a Wii U game called Star Fox-Metroid: Fusion Saga that crossed the company’s vulpine fighter pilot with its blonde bounty hunter in a crazy adventure. That information was as accurate as predictions that the world would end in December 2012. That said, when a complete list of trophies or achievements hits the web for a game or a downloadable expansion, they typically point to a legitimate release. It was true of Resident Evil: Revelations Unveiled Edition, and it was true of Dishonored: The Knife of Dunwall. The Dishonored DLC is out Apr. 16 and will cost $10 on PlayStation 3, Xbox 360, and PC. Arkane has also hinted that a third DLC expansion will follow later this year.